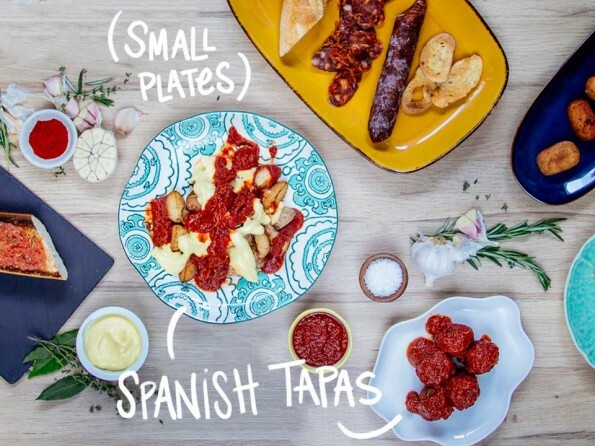 Fry’s (Kroger Co.) is taking customers on a gourmet journey to taste the exquisite flavors of Spain during an exciting two-week event, Savor World Flavor: Taste of Spain. A team of Fry’s food explorers traveled the regions of Spain, and collaborated with local producers and chefs, searching for authentic, yet easy to prepare meal ideas and beverages. Starting April 6, Taste of Spain will highlight the best flavors brought back for Fry’s customers, such as seasoned chorizo, smoked paprika garlicky shrimp, freshly harvested extra virgin olive oil, saffron-flavored paella, and smooth, fruity Chardonnay from Navarro. This ultimate foodie event will feature samples, recipe ideas, new food products and events that bring a taste of the Spanish culture to Fry’s stores across Arizona. The grocer will also introduce new internationally inspired products under its exclusive brand HemisFares™, which debuted with Taste of Italy last fall. These best-of-the-world eats are procured directly from their food-rich regions for Fry’s customers. This latest launch will introduce Spanish favorites including dry-cured jamón Ibérico de Bellota, rich and creamy spicy paprika aioli, and olive oil from the La Mancha region of Spain. Kroger will host a national Twitter party at 10 p.m. EST on Monday, April 11, for customers to learn more about Spanish cuisine and engage with an internationally known chef and culinary expert. To participate, follow @kroger on Twitter. This is the third Savor World Flavor event Fry’s has hosted, inclusive of Taste of México in 2014, and Taste of Italy last year. For more details, including recipes and cultural facts please visit www.spanishworldflavor.com. Fry’s Food Stores is headquartered in Tolleson, Arizona. The company employs more than 18,000 Arizona residents. The 119 Fry’s Food Stores service more than three million customers each week. Fry’s has been serving Arizonans’ with fresh food at famous low prices since 1960. In 2012, Fry’s was honored with the Arizona Fundraising Professionals “Outstanding Corporation” award for its community service and philanthropic efforts. The company also received a “Best Place to Work 2012” and “2013, 2014 and 2015 Top Company” awards. For more information about Fry’s Food Stores or online coupons, visit the company’s website at www.Frysfood.com. Fry’s is a division of the Kroger Co.